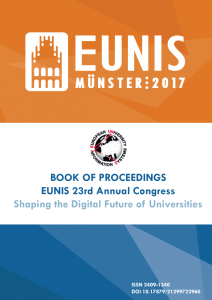 This issue of the European Journal of Higher Education IT (2017/1) consists of the full papers from the EUNIS 2017 congress. This presentation expands on recent reports about the IT workforce in higher education, conducted by the EDUCAUSE Center for Analysis and Research. We trace the career trajectories of four “Csuite” IT leadership positions to identify the paths individuals took to arrive at these leadership positions. Next we identify the skills that these individuals say are important for their success, and the skills that they believe they possess (or not). In the future, various new challenges will arise in quality-assured IT support at universities. University computing center are increasingly being encouraged to provide IT services not only for their own universities but for other universities and research institutes as well. Additionally, cooperation between various university IT service providers is essential. The joint service of different service providers of a university for additional external facilities leads to the need to adapt existing support structures in order to continue to guarantee the best possible quality of service. In the following these new challenges will be examined using the example of the IT Center at RWTH Aachen University within the context of transformation of support structures. Information and communication technology is at the core of administrative work and it has a significant influence on work and on the work environment. This paper presents a study designed at understanding the digital transformation of student administration at a large university. Through quantitative and qualitative data, different aspects of the digital workplace are highlighted. The study is part of the preparation for a new student information system that will radically change the work processes of student administrators. The current state of the transformation is described with help of the demand-control-support theory. Results indicate that motivational factors score less well than hygiene factors. The paper concludes by discussing possible strategies for increased resilience during the transition to a new student information system. This paper discusses digital transformation within higher education and proposes a layered capability model for structuring the required IT capabilities. Changes related to digital transformation are taking place in most institutions and, while there are differences in the selected approaches, similarities can also be observed across the sector. To define the landscape, we use two frameworks to describe those changes. On one hand, we characterise various aspects of the digital transformation in higher education at the institutional level and, on the other hand, we analyse the new expectations for the role of IT within institution due to this change. Our observations lead to the identification of a layered model of essential IT capabilities that are needed to cope with the ongoing change. We propose to use three layers. Firstly, basic capabilities are needed to provide a solid foundation for digital transformation within the organisation. These capabilities have already been part of best practices in traditional IT provision, but they are paramount to any attempt to engage in a digital transformation. Secondly, standard capabilities will be needed to maintain competitiveness in the ongoing change and will be essential for all institutions that are aiming at keeping abreast with their peers in the increasingly digital higher education business. Thirdly, advanced capabilities will be developed by those institutions that are aiming at using digital business as a competitive advantage. A single institution might not be able to excel in all these capabilities and, consequently, it is assumed that only a subset of them will be implemented in each organisation. Due to the diversity of the higher education sector and the ongoing innovation in the digital business, this paper is not intended to provide a comprehensive list of the required IT capabilities. Instead, it describes an approach that can be used to evaluate and transform the IT function of any institution to provide sufficient support for the institution’s digital future. The process of digitalization challenges universities worldwide, in particular the universities’ IT. Qualitative interviews with students were conducted to gather information on service requirements. Three service categories clearly dominate the students’ wishes for IT support: study organization, online literature and software provision. As regards the study organization, a centralized platform granting access to all relevant information and services (e.g. schedule, exam administration, certificates, study progress, contact information) is particularly important. From the students’ point of view, IT should enable them to focus on the content of their studies, provide support for organizational problems, and grant easy access to resources, such as literature and software, while at the same time require little effort. The CIO surveys in German Higher Education Institutions (HEI) allow a unique access to the development process of different IT-Governance implementations across a diverse developed university culture. This culture is often influenced by the traditions, the history and local politics in a specific way but also with a large variety. Not at all surprisingly, the individual HEI only slowly adopts different practices which primarily had been developed in countries with high tuition rates and thus a greater need for cost control and overall guidance. This paper therefore investigates if and how an overall benefit is visible for those institutions which build and implement a specific IT-Governance. The application of the global complexity index being developed by the CHEITA community as a baseline for comparison does reveal additional valuable insights. Especially the lack of payoff in the application of service management frameworks and increased benefit of the continuous awareness around information security becomes visible. Institutions investing in security awareness show a better spending rate in comparison to their peers on the GCI scale. Institutions spending their budget on the optimisation of the service portfolio fail to demonstrate their advantages. In general, bigger institutions allow their CIOs better to follow their goals. They also grant their CIOs effective access to the board of directors. In consequence, those CIOs can demonstrate a higher value of IT for their institutions. In January 2016 the German Council of Science and Humanities (Wissenschaftsrat) published the specification of a core data set on research activities and recommended a nationwide realization within the german science system. To serve this recommendation the federal state North Rhine-Westphalia (NRW) established the federal initiative CRIS.NRW. This paper describes the aim and approach as well as recent activities and their results to succeed and enhance structures of communication and support for the implementation of the Research Core Dataset at universities in NRW. Having recognized the need for a national digital asset management infrastructure, SRCE – University of Zagreb University Computing Centre in association with a number of research and higher education institutions in Croatia built a national repository system called DABAR – Digital academic archives and repositories. DABAR provides research and higher education institutions with the common infrastructure necessary to establish a secure, reliable and interoperable institutional repositories in a simple way. Dabar allows institutions to manage their digital assets without the need to deal with technical issues related to the implementation and maintenance of digital repositories. Until the middle of March 2017, DABAR was used to build two national repositories and 109 repositories of Croatian research and higher education institutions. Currently, it supports curation of electronic theses and dissertations, and papers published in electronic journals. The support for conference papers, book chapters, artistic works (photographs and other audio-visual objects) is being actively developed and a plan to build a support for managing research data sets and educational resources is in place. The DABAR platform and the community gathered around it are actively promoting Open Access to the results of research and to educational modules and resources. This paper deals with detection of flooding attacks which are the most common type of Denial of Service (DoS) attacks in a Mobile Agent World. We propose a new framework for the detection of flooding attacks by integrating Divergence measures over Sketch data structure. The performance of the proposed framework is investigated in terms of detection probability and false alarm ratio. We focus on tuning the parameter of Divergence Measures to optimize the performance. We conduct performance analysis over publicly available real IP traces, in Mobile Agent Network, integrated with flooding attacks. Our analysis results prove that our proposed algorithm outperforms the existing solutions. New approaches to teaching and research require machine readable interfaces as provided by service oriented architectures. Many scenarios in teaching as well as in research demand cooperation between members of universities. Identity federations and federated applications provide some means for collaboration. Current federation services for single sign on however are not compatible with common applications arising from service oriented architectures. The OAuth2 workflow allows personalized access to service oriented architectures for applications but lacks a definition for federated deployment. The presented extensions are based on the current implementation of OAuth2 They allow establishing a federation of OAuth2 token services that builds on top of the existing federated infrastructures in higher education. Based on national eID solutions for university process scenarios this paper discusses eIDAS extensions with regard to chances, changes, benefits and challenges compared to eID. Several initiatives in Europe are involved in the development of frameworks to improve student mobility. These aim at the harmonization of student data formats/forms and appropriate IT support for administrative procedures. Examples include the EUNIS task force for students mobility (formerly RS3G) or the Groningen Declaration Network or the Erasmus without Paper Project [11, 12, 25, 29]. Besides the standardization of forms and procedures security, privacy and legal binding of these is an important issue and hence discussed in this paper. The use of security functions like qualified signatures and the eID of the German national identity card (eID/PA or GeID/PA ) opened up new possibilities for the digitalization of legally binding processes in university management in Germany. Some of these innovations were developed within the projects “eCampus/Scampii” and “eID at universities” [20, 22, 23, 24], based on national signature and eID frameworks in Germany. Furthermore, chances and changes for security and legal binding by eIDAS regulation (, prepared by the STORK projects ) based extensions at university management are discussed in regard to the ongoing EU funded project TREATS (Trans European Authentication Services, funded by EU CEF Program). The most important is that the web pages are usable – it means it is easy to use the website, user find what are looking for. Otherwise, visitors leave them and click on the competitor’s website. The word usability has become the most inflected in the design and management of web sites and applications worldwide in recent years. Nielsen (1993) defined usability as a quality attribute – something that is easy to use. We are able to evaluate the usability. One of the common tool is System Usability Scale (SUS), which provides a “quick and dirty”, reliable tool for measuring the usability. (Brooke, 2013) It consists of a 10 item questionnaire with five response options for respondents; from strongly agree to strongly disagree. Originally created by John Brooke in 1986, it allows us to evaluate a wide variety of products and services, including hardware, software, mobile devices, websites and applications. We examined how the current situation in Slovakia is. There are no statistics for measuring and evaluating the usability of university websites. To fill this information gap, we conducted several interviews with administrators of schools websites. The interviews have shown that such a usability test have not been made. Therefore we formulated the research problem: Usability evaluation of universities websites and decided to find out the current situation. Research determine how many of universities in selected countries (Slovakia, Czech Republic and Finland) evaluate the usability of their web pages. We expect: More than 90% of schools do not evaluate the usability of their web pages. Due to the existence of information gaps and our concern for them to be completed, it was a plan of the research project in two main steps. Step 1: We ask administrators from all universities and colleges in 3 selected countries to fill in a questionnaire. The main question will answer our research problem. Step 2: We ask high school students to evaluate university websites by using SUS tool. The period of our research is from beginning of February to the end of May 2017. The results offer insight into the current state of usability of universities website in selected countries. We can identify the weaknesses of websites and propose to remove them. Thanks to the results we are be able to improve website usability, make it more comfortable and easier for users. The purpose of this paper is to describe legislative process using the terms of software engineering and to propose some new manners of detecting and avoiding defects in new law acts. The idea of software tester’s approach to lawmaking comes from the observation that software development and legislative process are similar. Paragraph 2 contains an explanation of that similarity, definition of some basic software testing terms and a basic discussion on the topic. Paragraph 3 presents some basic software development models. In paragraph 4, one can find a brief description of the legislative process in the Republic of Poland. Paragraph 5 contains a discussion on concepts concerning making better law. I give two new ideas: dividing legislative bills into two documents and setting off the Law Testing Committee, that would lead to better validation and verification of legislative acts. Better insight into the teaching process and targeted feedback to students, ultimately resulting in improved education: that is the idea behind learning analytics. Learning analytics makes it possible to follow students’ digital footsteps. These footsteps can be recorded and analysed, leading to the creation of comprehensive data collections. With this data, it is possible to make predictions about, for example, the quality of the teaching materials used, how teachers and students interact with the material, how the digital learning and working environment is used, etc. Learning analytics offers a great many possibilities, but how can an institution use it successfully? This is the reason why SURFnet started the Learning Analytics Experiment for Dutch institutes for higher education to gain experience with learning analytics. With this experiment, SURFnet demonstrates the possibilities of learning analytics in education. In this paper we present the set-up of the Learning Analytics experiment, the learning analytics architecture and infrastructure used for this experiment as well as the preliminary results and further work. FUAS (Federation of Universities of Applied Sciences) is a strategic alliance formed by Häme, Lahti and Laurea Universities of Applied Sciences. This paper describes how FUAS has found the way on how to share videos to each other. The introduction of e-Assessment is hindered by reservations, despite e-Assessment being a valuable tool for teaching and examining in general. These reservations concern mainly the fairness and reliability of e-Assessment as well as financial questions. The latter can be solved in practice by utilizing BYOD, since most of today’s students already possess devices that are capable of being used for e-Assessment. This poses, however, additional challenges to the fairness and reliability of e-Assessment. This paper presents an approach that utilizes cryptographic methods, like public key cryptography and digital signatures, and the version control system GIT in order to overcome this challenges. Based on these techniques a framework for e-Assessment was implemented as client-server architecture. Improving the student learning experience is an essential aspect of teaching. This paper presents the Learning Scorecard (LS), a tool designed to monitor and manage the learning experience of students in a course. The LS has a student view and a faculty (or course coordinator) view. The student view essentially focuses on time management and uses gamification to engage students with the course’s activities. In the faculty view, data is aggregated from the student’s view, enabling the course coordinator to monitor the average progress of students in the different classes of the course he/she is lecturing. The Learning Scorecard has been developed using Business Intelligence and performance management techniques. It includes a Balanced Scorecard and dashboards for the visualization and monitoring of the student learning experience. In this paper the design of the LS will be presented as well as some initial results with an ongoing experiment in a course lectured in different Higher Education programs within the same university. What is “Flexible and personalized education” anyway? How to create a digital learning environment consisting of various components and acting as a whole? Many institutions strive to provide education that matches the learning needs of each individual student. This places high demands on the digital learning environment (DLE) of an institution. One system that meets all the needs and requirements of every student and lecturer, does not exist, which is why a modular approach seems the obvious choice. In 2016, SURFnet translated this modular approach into a functional model for the DLE. This resulted in thirteen components for the DLE, that support several educational processes. Splitting the DLE into components is supportive for institutions in two ways: 1. It helps institutions to decide to what degree of control and management the components have to be placed in the architecture of the digital learning environment; 2. It helps institutions to determine in which way the components are connected and able to interact. The ongoing digitalization leads to a need of continuous change of ICT (Information and Communi-cation Technology) in all university domains and therefore affects all stakeholders in this arena. More and more ICT components, systems and tools occur and have to be integrated into the existing processes and infrastructure of the institutions. These tasks include the transfer of resources and information across multiple ICT systems. By using so-called virtual environments for domains of re-search, education, learning and work, the performance of daily tasks can be aided. Based on a user requirement analysis different short- and long-term objectives were identified and are tackled now in the context of a federal research project. In order to be prepared for the ongoing digitalization, new systems have to be provided. Both, a service-oriented infrastructure and a related web-based virtual learning environment constitute the platform Campus.UP and creates the necessary basis to be ready for future challenges. The current focus lies on e-portfolio work, hence we will present a related focus group evaluation. The results indicate a tremendous need to extend the possibilities of sharing resources across system boundaries, in order to enable a comfortable participation of exter-nal cooperating parties and to clarify the focus of each connected system. The introduction of such an infrastructure implies far-reaching changes for traditional data centers. Therefore, the challenges and risks of faculty conducting innovation projects for the ICT organization are taken as a starting point to stimulate a discussion, how data centers can utilize projects to be ready for the future needs. We are confident that Campus.UP will provide the basis for ensuring the persistent transfer of innovation to the ICT organization and thus will contribute to tackle the future challenges of digitalization. It is a simple idea, really. Learning is all about feedback. Runners, for example, use apps like the RunKeeper. Research shows that apps like that enhance engagement and results. And people think it is fun. The essence being that the behavior of the runner is tracked and communicated back to the runner in a dashboard. We, at Fontys University, wondered if you can reach the same positive effect if you had a dashboard for study behavior. For students. And what should you measure, track and communicate? We wondered if we could translate the Quantified Self Movement into a Quantified Student. It seems that every few years a new development (usually featuring technology), be it online learning or, more recently, MOOCs, heralds the ‘death of the university campus’. The physical evidence however always appears to contradict these predictions. Campus education continues to be relevant because learning is a social process but the nature of the facilities we need to provide is changing significantly. This paper looks at trends in the use of digital technologies on-campus and the organisational and management issues they pose. We concentrate primarily on the use of such technologies in spaces used for formal and informal learning and teaching. The paper makes the case that successful integration of digital technology is key to delivering excellent learning experiences on campus and we make recommendations as to how the EUNIS community can take steps to help develop smarter campuses in their own institutions. The authors are professionals who have supported a range of different universities in various aspects of learning space development. In the Congress presentation that accompanies this paper we illustrate the points with worldwide examples.